There are few events in Irish history as tragic as the death of Thomas Osborne Davis. He was a rare man whose impact on the history of Ireland has never been truly appreciated. 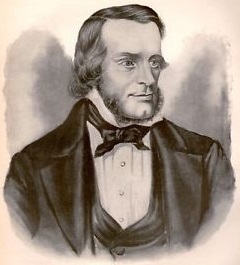 Born in Mallow, Co Cork on Oct 14, 1814, the son of a British Army Surgeon, he was educated at Trinity College and called to the Bar in 1838, but Davis heard another call: the call of Ireland. He heard it in the voice of Dan O’Connell when the Great Emancipator visited his home town in 1842, and asked a crowd of 400,000, “Where is the coward who would not die for Ireland?” This was a fiery young O’Connell, not the parliamentarian of later years, and he raised the consciousness of the Irish to a new spirit of nationalism. Men like Davis, filled with the fire of that patriotism, joined his cause. You see, after the brutal suppression of Ireland following the rising of 1798, the country remained depressed until O’Connell began to raise the issue of Catholic emancipation. It was then that the Irish people began to raise their heads again, but when they did it was not the voice of O’Connell they heard, but the voice of Thomas Davis and the Young Irelanders. The Nation became a great power whose place in history is that it rekindled the dying flame of Wolfe Tone’s nationalist doctrine of Irishmen – Catholic, Protestant and Dissenter, together for Irish freedom. The gallant attempt at independence by the United Irishmen of 1798, and by Robert Emmet in 1803 were all but forgotten. England’s brutal and abusive suppression after those attempted risings had all but stamped out the memory of the great Tone and his ideals. The Nation revived that memory, and the sentiment that had inspired it, and in so doing, created a nationalist tradition that has lasted to this very day, due in no small part to the writings of Davis himself. His memorable poems about Fontenoy, the Clare Dragoons, and Wolfe Tone were on the lips of every Irishman of the age. He drew to his philosophy such talented future leaders as John Mitchel, Speranza, William Smith O’Brien, Michael Doheny, Clarence Mangan, D’Arcy McGee, and Thomas Francis Meagher. His followers became the Young Irelanders, and their impact on history was considerable for they carried Davis’s philosophy into the origin of Ireland’s greatest nationalist movement – the Fenian Brotherhood. Unfortunately they did so without the master, for Thomas Davis succumbed to a fever brought on by an exhausted condition, and he died at his mother’s home in Dublin on September 16, 1845. It was only a month before his 32nd birthday and just at the start of An Gorta Mor – the great hunger that would devastate his beloved Ireland. How he would have faced that tragedy can only be imagined, but there is no doubt that it would have been memorable.